Xcode, in all its mind-bogglingly incomprehensible wisdom, makes the simple act of renaming a folder a chore. If you’ve ever used any IDE ever released on any other platform in the history of computing, you would think it would be as simple as right-clicking (er, command-clicking) on the folder and selecting ‘Rename’. Sadly, no. There’s no rename option. But wait – there’s a ‘Group Name’ option in the File Inspector. Just change that and… nope. That just changes the name as it appears in Xcode, not the name of the actual folder on disk. What you actually appear to have to do is rename the folder in Finder, then click on the little folder icon in the File Inspector and point the group to the new folder. Oh, and don’t even think about renaming your project. That would just be stupid. In order to distribute your work on the app store, or test your work on your device, you need to sign up for the iOS developer program at a cost of $99 per year. What purpose does this fee serve, aside from turning away potential developers? It’s certainly not making Apple rich. According to Apple, there are over 500,000 apps on the app store. If we make the tenuous assumption that there’s a 1 to 1 ratio of apps to app developers, we can guess that there are around 500,000 registered iOS developers, who altogether make Apple a tidy sum of $49.5 million dollars per year. Sounds great, right? Well, not when you consider that Apple took in $28 billion in revenue in the last quarter alone. That 49.5 million dollars in annual developer program fees is approximately 0.017 % of Apple’s quarterly revenue. Less than a drop in the bucket. No, the real reason, as I see it, is to intentionally raise the bar to attract only the developers who are serious about the platform. Were there no annual fee, the app store would likely be (even more) deluged with lower quality apps, and the approvals team would be even more swamped than they already are. This is certainly a valid point, but it hurts small developers, as even the simplest apps now have to sell approximately 142 copies per year just to cover the developer program fees (and that’s not even considering the other fees associated with iOS development). As a newcomer to iOS development, this is a somewhat scary number. Since the motivation for the annual fee is quality, not direct financial gain, I have an idea to ease this pain: refund some or all of the fee for each app that is successfully submitted to the App store. By doing this, Apple would still create its desired barrier to entry, but it would be less of a burden on small-time developers. And as the money would not be refunded until an app successfully passed the submission process, developers would have just as much incentive – if not more – to release high-quality apps. Of course, none of this matters, because Apple would never do such a thing. But I can dream. 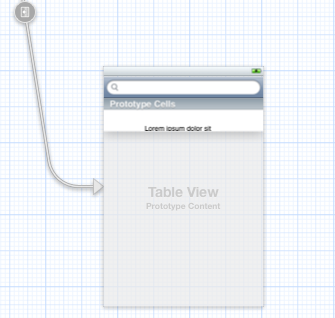 Storyboards are one of the coolest features of Xcode and iOS development. New to Xcode 4.2, they not only give you a visual overview of all the screens in your application, but they show you the transitions – or segues – between the screens. This is a few steps above and beyond the likes of what Visual Studio can do. Instead of seeing a single control or a single window at a time, you can see all of them, plus the way they relate to each other. Some of the features of storyboards are not particularly discoverable, though, such as the Ctrl-clicking and dragging to create a segue (or an outlet, but I believe that’s just part of Interface Builder that’s been there for a while, not a feature specific to storyboards). There are also some fairly unintuitive behaviors with regards to zooming and selecting. It appears that there are only four zoom levels – you can’t zoom in or zoom out arbitrarily. And selection works differently at the different zoom levels. For example, if you aren’t zoomed in all the way, you can’t select individual controls; you can only select entire views. But if you click on a control in the document outline, you are suddenly zoomed in to it. Not deal breakers, of course; just things that might initially surprise you. 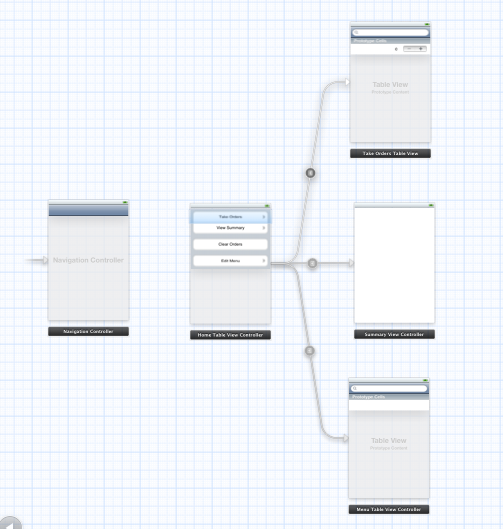 Minor quibbles aside, storyboards are a terrific step forward in the realm of visual designers, and one that I would love to see in Visual Studio. By the way, if you’re looking for a great storyboard tutorial, check out Ray Wenderlich’s Beginning Storyboards Tutorial. Multiselect in a UI designer is a pretty standard operation. If I want to change a property on a number of controls at once, I should be able to simply ctrl-click them (or command-click, or option-click, and so on) to select them all, and change the property. 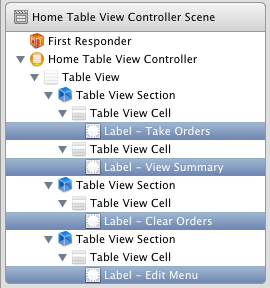 Unfortunately Interface Builder doesn’t seem to support multiple selection on controls in different UITableViewCells. Attempting to do so always results in the first control being deselected. However, there is a workaround, which is why this entry is really half ‘iOS Pain Points’, and half ‘iOS Quick Tips’. It turns out you can multiselect across table cels by command-clicking in the Document Outline window on the left. Not entirely intuitive, but it does the trick! Figuring out how to set the default view controller on a storyboard is surprisingly unintuitive, especially as someone new to iOS development. It seemed logical to me that it would be some sort of setting on the storyboard itself. However, it’s actually the exact opposite – it’s a setting on the view controller. Voila! 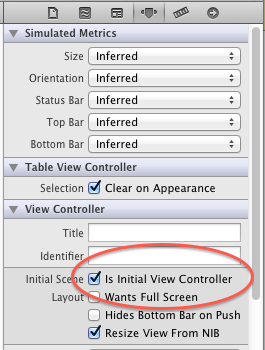 Your view controller is now the default view controller for this storyboard. Step 1: Add a UISearchBar to your UITableView and create an outlet for it. Step 2: Add properties for the array of all the table data, and the array of filtered table data. Step 3: Assign your search bar’s delegate to your controller class. Step 4: Implement the searchBar:textDidChange: method from the UISearchBarDelegate protocol. This will let you filter your list as you type. If you want to filter when the search button is clicked, use the searchBarSearchButtonClicked: method instead. In this example, we are searching through a list of foods with names and descriptions to see if the match the search text. If they do, we add them to our NSMutableArray containing our filtered foods. We also set a flag that indicates whether or not we are currently filtering the list. Step 5: Modify our other UITableViewController methods to make them aware of the isFiltering flag, and to use the correct list depending on whether or not we are filtering. Voila! You now have a UITableView that can be filtered using a UISearchBar. 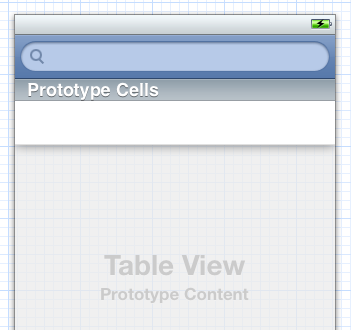 Download the UITableView Filtering Demo Project (updated July 8, 2012 to show row selection and disclosure indicator handling).